Ultimate Mail Mod is an extension to the existing mail system. The original interface is "hidden" and "replaced" by the UMM interface. -Lists up to 30 mails in the inbox. -The sender's name of each mail is color coded by reference type. -Alternative icons displayed for mails depending on their read/unread status. -Displays mails inside the UMM window on the right hand side of the window. 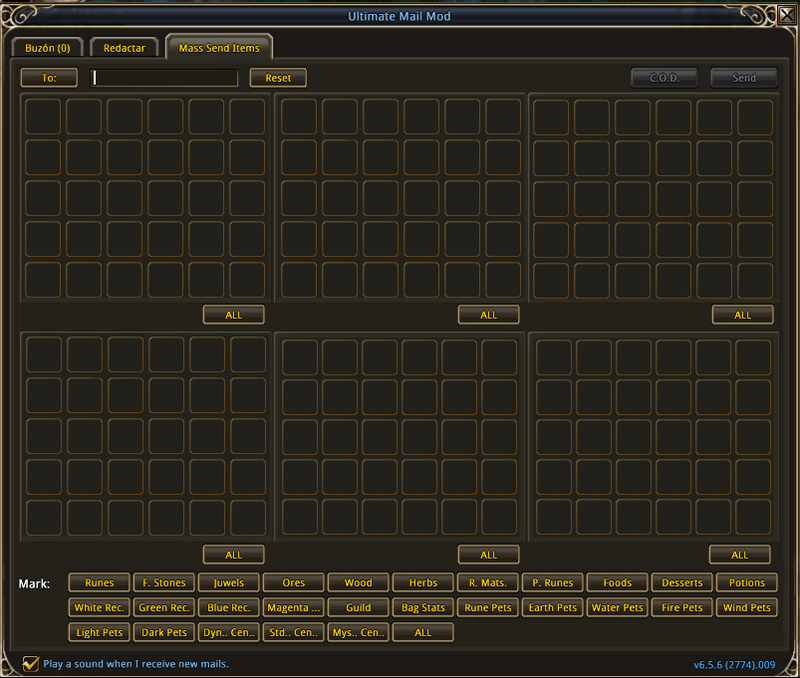 -Displays total amount of gold on all visible mails in the inbox. -Inbox offers automatic opening and grabbing of attachments. Can be filtered by items, gold or all. -Inbox offers automatic mass-return / mass-delete of mails. Ctrl+Left-mouse to toggle tags. -Mail Composer adds lists of "Characters", "Friends" and "Guildies" (if guilded) for easy recipient selection. -Automatic subject creation if you only attach money. -UMM automatically logs and saves the names of all the characters you use on your computer. -Full backpack (all 6 tabs) display of items. -Click an item slot to toggle that slot for sending. Will display a yellow border around the slot if it's marked for sending. -Choose to either just send all the items right away or set up C.O.D. values for each slot of items sent. -Display of current send status - mails listed and status displayed: "sending" or "queued". Top-most mail is the one being sent. -UMM has a complex set of checks to prevent accidental deletion of mails containing items aswell as built in checks to stop automation in case of any failures. -Every 15 minutes UMM will call a memory cleanup function which is built into the scripting language. This function clears up any unused variables and left overs from addon data handling and thereby lowers the total addon memory usage for all addons which in turn increases performance. This cleanup is not automatically performed by the scripting language but must be called. The game currently has some crash issues which usually result in loss of settings in addons - the cleanup has nothing to do with the loss of settings. Other addons that don't store their settings correctly may be affected by the cleanup. Ultimade Mail Mod was developed by Shareda of Siochain. As it seems that this AddOn is no longer maintained, Maxeem of Muinin took over maintainin this usefull Interface enhancement. For next release can you please add monster cards to the filters? Sometimes I remove a bunch of cards from one of my toons to transfer to another, and I'd like to be able to select all monster cards in my inventory to send via mail. Thank you. Thanks mate for the new button. But now, i need you again. Is possible add "all!" button for all backpacks? Something as this... I have more backpacks and pressing the button all, selected all backpacks but I need only select two. Is possible all button for each backpacks? That way if u press CTRL key and select an item it will select all those items in all bags. So suppose you have 12 satcks of Strong Stim scattered around in your bags this way you can can select them all at once. Hi there, I wanted to share my quick&dirty code for selecting all non-bound items in a bag slot. Since i dont need the 'select recipe' buttons I reuse them. Now if you select the 'white rec' button it will select all in bag 1, select 'Green rec' it will select all in bag1&2. If you want more slots just change the 'for index = 1, 60 do' number. I am uploading an update now. I have been unable to add select by rarity option as of yet. it would involve far more than i even thought it would. There were also some general changes and updates to the DB. Work is a pain in the ____! I will get to this soon. Is there any way to select all blue items in massive send items with 1 click? Hello, is possible add a button of "Select all items"? Click, one for one is very stressful and tiring. In Bone Peak, I need this button. There are some button of select all? If not is, please add this button. I believe this can be done wut i will have to look into it. Really? Excellent!! Really need this button, select one for one is very annoying. I hope that you can add this button. Luck and thanks!! is there any way you could make a selection tab for crafting mats so it will just select the white/green/blue/purple ones? Yes this can be done. but! this will require a rewrite of the item db for the addon. this will take time and i am currently in high demand at work. i will get to this as I can. After some try, i find he work best in english. (rom client in english).